One of the wealthiest countries in Asia, the island country and city-state Singapore is one of the places that people from around the world would love to visit. From the symbolic Merlion, the beautiful Marina Bay, the enchanting S.E.A. Aquarium, the fun Universal Studios, to the delicious food and the fun shopping experience, it is really is a place of wonder and excitement and it's also great if you are visiting Singapore with kids. Let’s not ruin that excitement though, with the stress and hassle of documents or lack thereof that might prevent you from enjoying or even starting your adventure. If you’re planning a visit, as a general rule for travellers, you should check first the requirements for entry on the country and make sure that you fulfill all of them before your trip even if you are only staying for one day in Singapore or more. Here’s a guide on how to get a visa and tips on how to enjoy a hassle-free adventure in Singapore. BONUS: WHERE TO STAY IN SINGAPORE? Those who are British passport holders that are without a proof of right of abode in the UK (United Kingdom) have a shortened visa-free stay of a maximum of 30 days instead of 90 days. As aforementioned, citizens of countries that are not listed in any of the below (later on the article) whether visa required or Visa-Free, are allowed the maximum of 30 days without a visa in Singapore. Aside from those who are non-ordinary passport holders of countries listed in Assessment Level I (with the exception of North Korea), visa requirements are not applicable to those who are holders of official/service or diplomatic passports of Jordan, Tunisia, Bangladesh, and those with diplomatic passports of Morocco and Saudi Arabia. A travel document or a passport with at least six months validity at the time of departure. If you are a holder of a travel document such as a passport from any of these countries, you can obtain a visa online through a partner in Singapore or a Singaporean contact. You can also apply at the nearest Singaporean diplomatic mission or through an authorized visa agent outside of Singapore. Normally, the visa is issued within 1 working day. You or the applicant can travel with a printout of the Singapore evisa. It is needed for the citizens of the counties in the list below to obtain their visa in advance. The application can be done through a partner in Singapore or a Singaporean contact. They can also get obtain one at the nearest diplomatic mission of from an authorized visa agent outside of Singapore. Normally, the visa is issued within 3 business days. A visa vignette will be affixed on the passport of the applicant. They shouldn’t be travelling on a low-cost airline (an exception for those travelling on Scoot with Scoot-thru and those travelling with Tigerconnect through Tigerair). Here are some reasons for denial of visa that you may want to take note of and keep in mind. The photo is not clear or is blurred. Unfortunately, if your features in the photo are not clear, the Singapore Consulate will not accept your visa. So make sure your picture is bright and it shows your features clearly. The double application can get you denied too. Be patient in waiting for the release of your documents instead of repeating or doing the application twice as this will arouse suspicion why you would have to have 2 visas. These are just some of the tips and guides. If you’re still in a loop and confused on how to go about the application, consult friends who have previously travelled to Singapore or trusted travel agencies. It’s always best to plan your trips carefully so you be confident and sure that you will get the most of your trip to your dream destination. 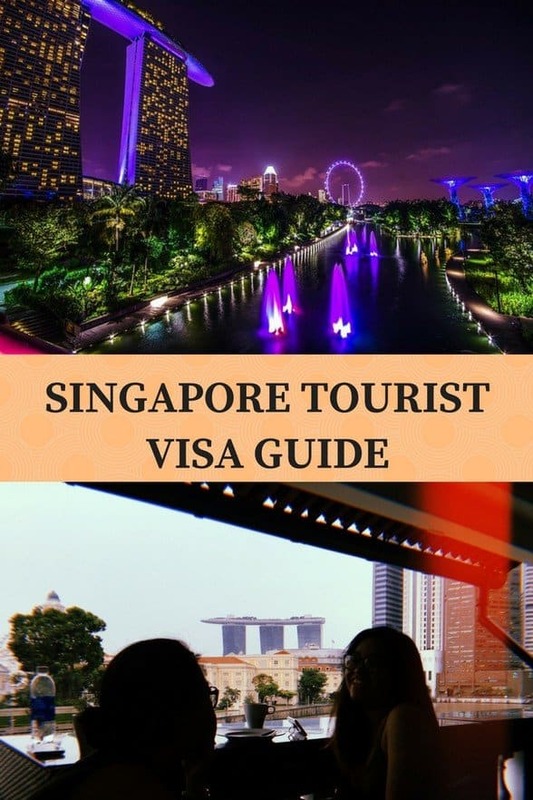 I hope you find this Singapore tourist visa guide helpful. Recently, I did a quick trip to Singapore to assist my nieces who travelled for the first alone. They had a long connection (an incredible layover that we managed to maximise) on their flight from Perth, Australia to Manila, the Philippines in Singapore. I decided to hop on a plane and make sure they can experience the life I have been living in the past two years. We stayed in a hostel called 5FootWay.Inn located in Boat Quay and introduced them what a hostel life is like. We both loved the place which offered a great view of Singapore River and the famous landmark of Marina Bay. IF you are looking for a place to stay in Singapore, I really recommend 5FootWay.Inn. Book directly to them and enjoy a 10% off using AMR10 as discount code! Email the code and your details before booking to marketing@5footwayinn.com in case the promo code doesn’t work. More options for accommodation on Best Hostels in Singapore article.